Theatre de Paris presents the Kibbutz Contemporary Dance Company with Mother’s Milk, by Rami Be’er and a Masterclass by the Opera of Rome, starring Eleonora Abbagnato and Benjamin Pech. Good news for all the ballet lovers : the Theatre de Paris decided to include Ballet Companies in its programation for the end of the 2018 season and will pursue in this dynamic for the next season. The Direction of the Theatre called Lisa Martino to help them in this mission. Former ballerina at the Opera de Paris and now actress, Lisa Martino seems to be well-skilled to elaborate ambitious programs. recently reinvigorated by Eleonora Abbagnato, Etoile at the Opera de Paris, who has been named as the new Director in May 2015. As we annouced previously, the Kibbutz Contemporary Dance Company (KCDC) was hosted by the Theatre de Paris for 6 performances of Mother’s Milk, between June 13th and 17th. Rami Be’er signs here a very dark and personal work as he uses memories of his late parents to celebrate their heritage. This ballet is a real tribute to his parents, and especially his father, who was one of the creators of the concept of kibbutz in the 50’s. Be’er creates a very strange atmosphere, dark and powerful. Through his choreography, he talks about love, creation, links between human beings and transmission of our culture. What is the most specific and impressive in Mother’s Milk, is how easily Be’er uses different styles of dance, borrowing steps to hip-hop, breakdance, contact dance, and melting them to classical and contemporary techniques to create a consistent choreography. The group parts are very intense and dynamic, while the solo and duo parts can be humouristic or more abstract. The work on the music is very interesting as it is composed as a patchwork of different composers, from J.S. Bach to James Blake. Rami Be’er not only created the choreography but also the scenery and lights, and participated with Lilach Hatzbani for the very nice costumes. That’s not surprising that the KCDC is now one of the most emblematic Israelian company with the Batsheva Dance Company. At the end of the show, the company received a fantastic and well-diserved standing ovation. 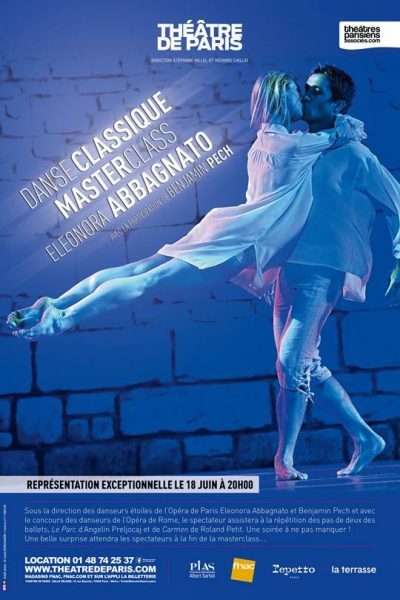 For their second ballet program the Théâtre de Paris invited two prestigious guests : Eleonora Abbagnato and Benjamin Pech, both from the Opera de Paris, for a unique show with four other dancers from the Opera of Rome, which Eleonora Abbagnato has become the new director since 2015 while pursuing her career as Etoile at the Opera de Paris. Benjamin Pech, who made his farewells to the scene in 2016, has joined Eleonora Abbagnato at the Opera de Rome as Ballet Chief. For this occasion, they presented a novel kind of show called “Masterclass”, which is a very interesting concept as the audience is invited to follow rehearsals of classical variations on stage. Eleonora Abbagnato and Benjamin Pech, always very accomplices, give their instructions to the four soloists dancers. For this program, they chose two very meaningful and sensual pas-de-deux with Roland Petit’s Carmen and Angelin Preljocaj’s Le Parc. Both are very significant for them as Roland Petit was kind of a mentor for Eleonora Abbagnato and as her and Benjamin Pech formed an emblematic couple for Le Parc. Roland Petit and explain every movement’s signification. They insist a lot on the dancers for having the right expression. Roland Petit’s choreography are indeed very theatrical and the intention is directly linked to the execution of a movement. The mischievousness and seduction of Carmen is very interesting also for audience to understand. Eleonora Abbagnato is very demanding but also very benevolent towards her dancers to whom she transmits all her experience of the role. She forms with Benjamin Pech a very efficient duo. The second pas-de-deux, extract from Le Parc by Angelin Preljocaj and called “The Abandonment”, has become iconic since its creation in 1994. On the music by Mozart, two lovers, Giorgia Calenda and Claudio Cocino, finaly fall in each others arms after trying to resist. This pas-de-deux is very different than in Carmen as the contact between the two bodys plays a key role to find its peak during the famous “flying kiss”, which has even been taken over by Air France for one of their commercials. ballet lovers, it was really a privilege to assist a rehearsal of such a quality, and for laymen, it was a good introduction and education to this art. The first ballet season of the Theatre de Paris was of high quality and received a great success from the audience. At Kulturkompasset, we can’t wait for the new season!